You never feel the dark until your light is gone. Here I sit after finishing Breathe You by Celeste Grande, my heart still beating to the tune of this BEAUTIFULLY BROKEN BOOK. Breathe You blasted through me like countless cannons catapulting my heart, a heart that pounded out of my chest, where every word pierced me everywhere. Tears were etched in my eyes from the emotions that escaped all over the pages like raindrops. I SHATTERED into pieces!!! This heart-clenching tale crushed me so hard that I found it hard to breathe. Breathe You was my SOUL STORM, my sun that shattered the dark clouds, my heart and soul in words. I did. That was why I was dying. Eva is as brave as she is beautiful, and as she goes to battle to bring herself back from the dead, I felt like a friend beside her in her ear of healing. I adored this strong heroine more with every page as she found herself after being so lost. “When I give myself to you again, I want you to have someone that’s whole, not be picking through my fragments. Blake is a man as beautiful inside as out. If I had to create the perfect hero, it would be Blake. Blake is the light to Eva’s dark, the man to bring the angel back from the devil’s hold, to help his soulmate see the light. He took my hand in his and brought the inside of my wrist to his lips. My always poetic Blake let the most beautiful words caress the delicate skin. I MELTED into a puddle of tears from these beautiful words that caressed me so much, making my heart leap out of my chest! Blake and Evas’ chemistry and connection are UNDENIABLE. This hero and heroine are built for each other—the truest of soulmates—and I loved them both. PERFECTION! Breathe You is the HEARTBREAKINGLY BEAUTIFUL and BREATHTAKING love story and journey of a heroine’s metamorphosis from broken caterpillar to bold and brave butterfly, an inspiration to all that can bravely utter ‘me too.’ It’s a journey of shining after shattering. It’s healing after heartbreak. It’s bits of ugly woven with bits of beauty. Breathe You flawlessly BLEEDS BROKEN WITH BEAUTIFUL. One would think that, without a heart, you’d feel less. But I’d have to rebut that argument. I now knew it to be a falsity because I felt much, much more. I was feeling . . . everything. I BROKE SO HARD but REVELED IN THE BEAUTY beneath the broken pieces of Breathe You. 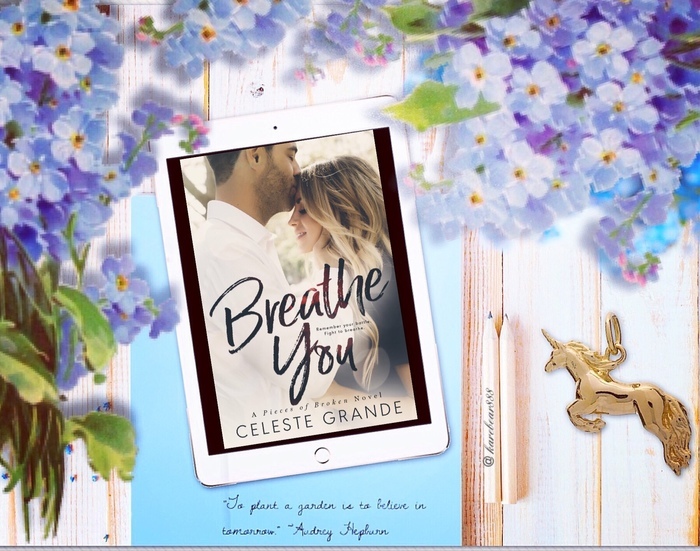 Celeste Grande took my emotions on an extraordinary journey in Breathe You where I FELT EVERY WORD. This tale took every smile … every sigh … every swoon … every tear …. every feel … EVERYTHING!!! Oh did I LIVE and BREATHE every bit of Breathe You! I FELL HEAD OVER HEELS for this STUNNING and SOUL-SHATTERING love story that STIRRED MY SOUL and HELD MY HEART, engraving it … ENGRAVING ME. My heart is still stuck in this story and will beat for Breathe You always. The perfect continuation of Live Me, Breathe You is DEEPLY MOVING and UTTERLY UNFORGETTABLE. A TOP 2018 and LIFETIME READ!! !